Grand Central Foods has been a fixture in the downtown York community for over 50 years. Family owned and operated, Grand Central Foods is one of the few remaining non-chain supermarkets that focuses on superior customer service. Our mission is to bring you the highest quality groceries at affordable prices. We believe that our customers deserve a large variety of items to choose from. Our friendly staff will help you find exactly what you are looking for and to offer assistance regarding all the products we carry. From our grocery aisles, to our produce department, to our meat counter, we want you to select the best for your family. With warm smiles and clean, open aisles we want your shopping experience to be positive. Open from 6a.m. to midnight, seven days a week our family is always here for you. 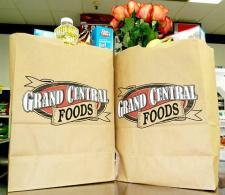 Your loyalty to Grand Central Foods is much appreciated and we are happy to bag your groceries and carry them to your car. We know that you have many options for food purchases and we work hard each day to continue to earn your business. Thank you for choosing Grand Central Foods. We are proud to be a long-standing member of the community and look forward to serving the families of York and the surrounding area for generations to come.